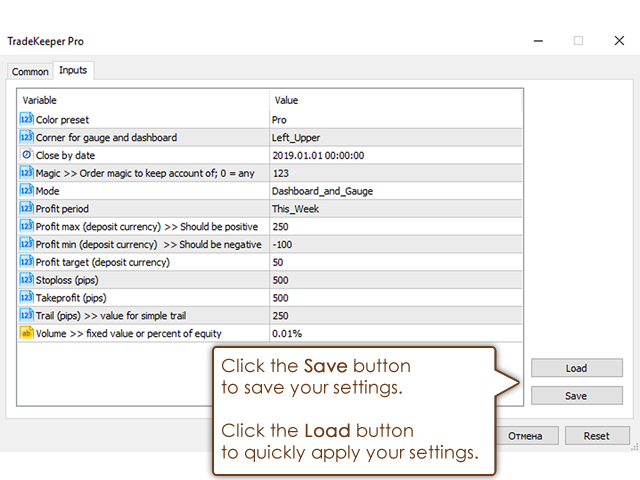 The utility TradeKeeper Pro allows you to open a trade manually with a magic and a volume of your choice. It does not open its own trades, it can only open a trade by your command. TradeKeeper Pro can trail any open trades by the iSAR (parabolic) indicator, and a simple trail. It can set the stoploss level at the open price as soon as possible. To trail any open trades for any instruments, it suffices to launch the utility in one chart. TradeKeeper Pro can close any trades or pending orders of a specific type. Using the utility buttons, you can close all, close all that was opened before a specific date, close all profitable, close all losing, close all limit orders or close all stop orders. TradeKeeper Pro can show your profits for different periods and bip a sound when you reach a profit target value. 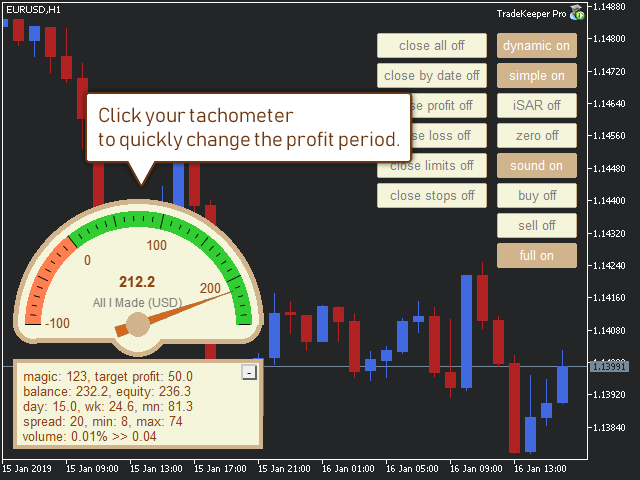 Click the tachometer to quickly switch to the next profit period. There are 5 of them: This Day, This Week, This Month, Last 90 Days and All I Made. Color preset - you can choose among 4 for now. Corner - choose where to place your data: Left_Upper corner, Left_Lower corner, or Right_Lower corner. Close by date - allows to close all that was opened before this date. Mode - three modes are available: Dashboard_and_Gauge, Gauge, and Dashboard. Profit max - it is used for creating your tachometer. It should be a positive value in your deposit currency. Profit min - it is used for creating your tachometer. It should be a negative value in your deposit currency. Profit target - you indicate this in your deposit currency. The TradeKeeper Pro calculates the current profit value as a difference of Equity and Balance. When the target you set is reached, the TradeKeeper Pro notifies you with a sound. Trail - use pips. To start trailing using a simplу trail, activate the simple button in the chart. Volume - a volume for trades opened by the buy and sell buttons in the chart. Set a fixed value (example: 0.01), or a percentage of equity (example: 0.03%). dynamic - activates a search of stoploss and takeprofit levels by the nearest bar extrema. These levels may not be closer then the values of stoploss and takeprofit currently set. simple - activates a simple trailing-stop. The value is set with the property Trail. iSAR - activates a trailing-stop following the iSAR (parabolic) indicator. It is recommended if you like to open lengthy, trending trades with a large takeprofit value. zero - a stoploss is going to be set at the open price line as soon as the trade gets profitable. sound - activates sounds of a new trade, a trailing-stop move, and a closed trade. buy - opens a buy in the current chart with a magic and a volume of your choice. sell - opens a sell in the current chart with a magic and a volume of your choice. full - shows / hides most buttons. close all - closes all open trades and pending orders. close by date - closes all that was opened before a specific date. close profit - closes all currently profitable trades. close loss - closes all currently losing trades. close limits - closes all pending limit orders (reversal orders). close stops - closes all pending stop orders (continuation orders). 1. I added new buttons, now the utility can close trades. 2. I updated color schemes.